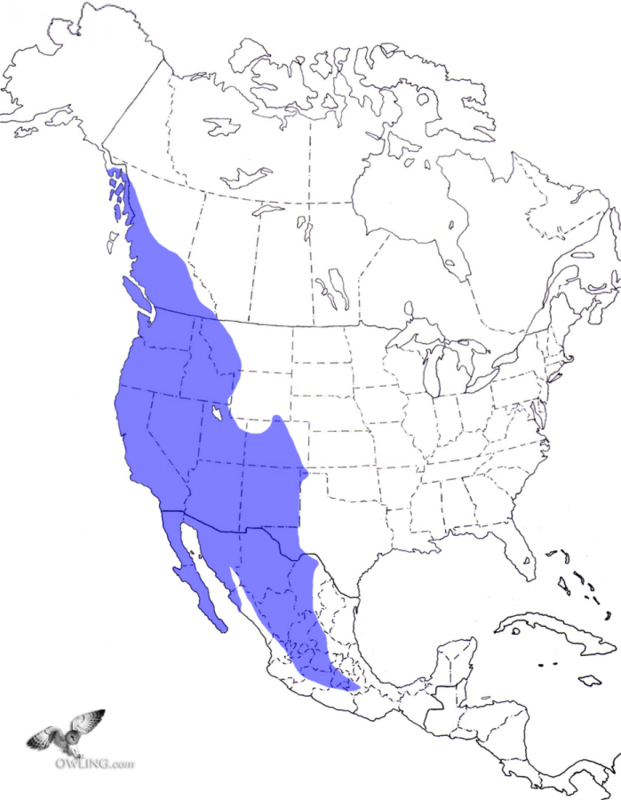 The Western Screech-Owl is a very common resident in much of the Western U.S., Canada and Mexico and is often the most abundant night predator in its range. There are nine subspecies or races most commonly accepted. These races vary significantly in size, color, and individual markings. 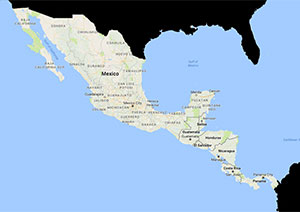 In a very broad sense the subspecies are larger and browner in the north and smaller and grayer in the south. The M.k. macfarlanei race that extends north into southern British Columbia averages more than twice the size of the xantusi in southern Baja California. Western Screech-Owl is considered to exist in only brown and grey color forms although individuals in the north-west of British Columbia and the north-west of Mexico can be very red in color. 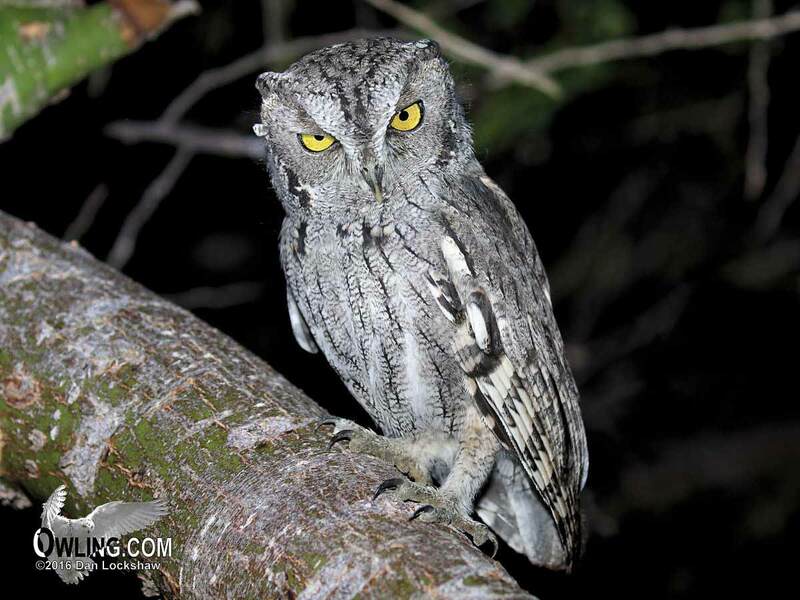 Visual differences even between the three species found in North America (Western, Eastern, and Whiskered Screech-Owls) are also not conclusive. 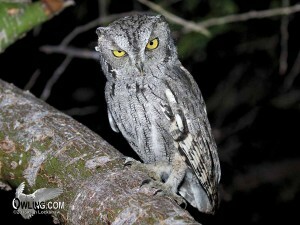 In the field the screech-owls must be identified by sound. 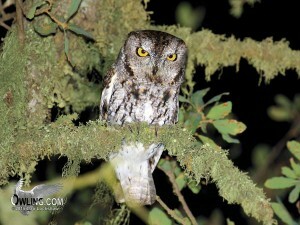 Here you will find video, photos, recordings and a brief field notes section to help identify and enjoy this beautiful owl. A more in depth write up can be found on its natural history page. 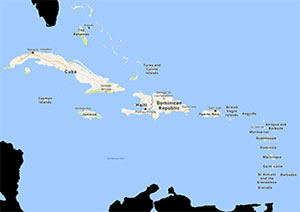 This is the primary territorial call most frequently heard in the field. The double note is a primary call although not as frequently heard. This is generally associated with an excited owl. A pair of owls, very excited, “talking” to each other. This is a male/female pair. 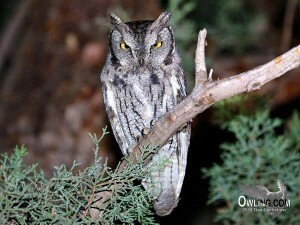 Western Screech-Owl is a common owl in the western USA. It is a nocturnal owl species. Separation in the field, of our Screech-Owl species, is actually only reliably feasible by voice. 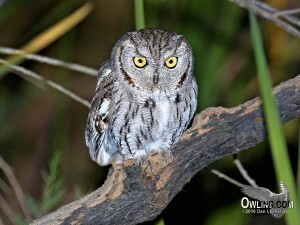 The Western Screech-Owl can be distinguished with his primary “bouncing-ball” (territorial) call. Male and female owls can be distinguished by their call since the female’s voice is higher in pitch. The sexes are alike in appearance although the female is larger. This can be difficult to see in the field and their call remains the simplest method to distinguish the sexes. The ear tufts may or may not be visible in the field. 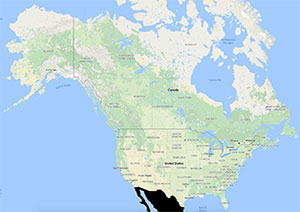 Color varies but most commonly they are gray to brownish (rare reddish forms are found in coastal British Columbia/Alaska and north-west Mexico). The bill usually has a dark grayish to black base (sometimes even greenish in northwestern great plains) and a yellow to horn colored tip. The eyes (iris) are yellow. The different races vary quite a bit in color and specific markings. Length is 8 1/2″ (about the size of a Red-winged Blackbird). 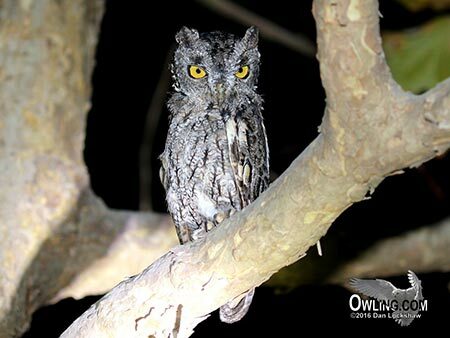 The average lifespan of a Western Screech-Owl is probably fairly short. The average re-encounter age for banded owls is about two years. A couple very old banding records from the 1920’s re-encountered Western Screech-Owls 13 years apart and there are only a little more than half a dozen other banding records where this species has reached more than 7 years of age.